Here is another beer from the 2012 Sam Adams Holiday Variety Pack, my review of the Samuel Adams Holiday Porter. Now I've always been a big fan of porters and stouts, especially in the Winter. There's something fitting about having a nice, warming, thick dark beer on a cold Winter's day. When I saw this beer, my hopes were high. 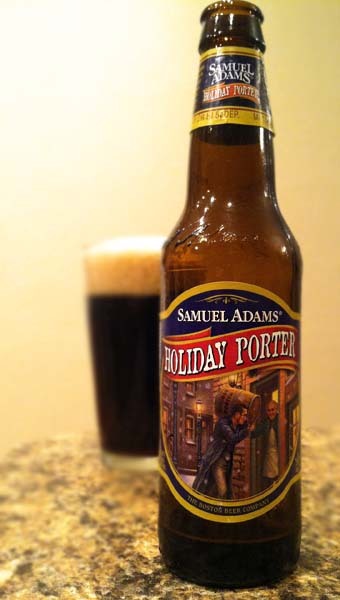 The Sam Adams Holiday Porter comes in at a respectable 5.8% ABV and a moderate (for the style) 40 IBU's. This beer is supposedly a throwback to the oldschool style porters from the past, but I can't really say whether it's authentic in that or not. But, not that it really matters how authentic it is. The Samuel Adams Holiday Porter pours a dark brown color that lets a slight bit of light go through, with a nice thick, long-lasting, lacy tan head. Aromas are predominantly malty with some dark roasted coffee and rye bread notes. Tasting brings a decently thick and creamy mouthfeel with quite a bit of malts, a breadiness, a touch of toffee, and a bit of bitter hops that are evident in the finish. All in all, a solid porter. Nothing amazing, nothing ground-breaking, but good... and very drinkable. I could easily drink a couple of these in a sitting. I really enjoy the mouthfeel here, whereas a lot of porters I've had recently have seemed a little too thin. Drink This: if you want a solid porter. Don't Drink This: if you want a porter that's out of the ordinary.